An ink-brush figure painting by modern master Fu Baoshi (1904-65) grossed HK$204.85 million ($26 million) at a Christie's auction Tuesday in Hong Kong. 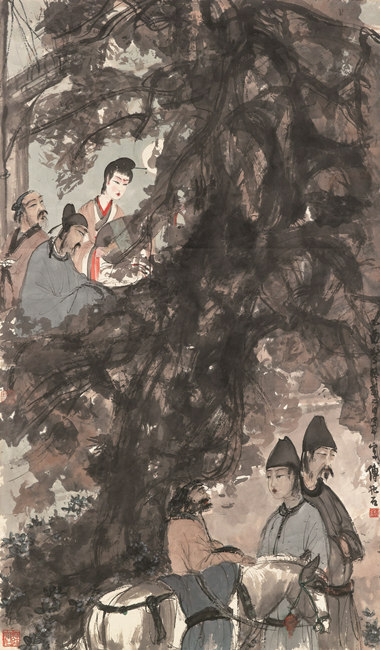 The painting titled The Song of the Pipa Player articulates a scene described in a famous narrative poem from the Tang Dynasty (618-907), written by statesman and poet Bai Juyi. The painting demonstrates Fu's interest in classic Chinese literature and his maturity with visualizing some of these works through precise brushstrokes and skillful handling of colors. It was once in the family collection of Hsiang-his Kung, an influential banker and politician in early 20th-century China. Fu's most expensive work at auction is an album of eight landscapes he produced between 1964 and 1965 to narrate poems of the late chairman Mao Zedong. It fetched 230 million yuan ($34.9 million) at a Beijing auction in 2011.